It’s been a particularly noisy few weeks for Brexit, but the quest for a solution that can unite the British parliament remains as challenging as ever. To recap, Prime Minister Theresa May’s Brexit deal was defeated in parliament by a heavy margin in January, and to turn things around, she’ll need to convince around 115-120 lawmakers to get behind a new plan. That broadly leaves three main options – adjust the current deal to win Conservative votes, re-write the deal to get opposition MPs on board, or put the choice back to the voters in a second referendum. Despite the initial talk of cross-party cooperation on Brexit, Theresa May has stuck closely to ‘Plan A’ in a bid to win over pro-Brexit Conservatives, and thereby hold her heavily divided party together. Emboldened by a victory in the House of Commons, where a majority of MPs voted in favour of renegotiating the Irish Backstop, May has returned to Brussels to seek meaningful changes to her deal. Unsurprisingly though, Brussels is still refusing to budge. As it has said many times, adding a legally binding time limit on the Irish backstop would prevent it from being an ‘all-weather’ insurance policy against a hard border. There is also deep scepticism any ‘alternative arrangement’ involving technology would be enough to emulate customs and regulatory checks on the Irish border – or that it could be developed in time. Even in the unlikely event the EU was prepared to renegotiate, it would want to be sure any concessions it gives would make the crucial difference in getting backing from UK MPs. Don’t forget the EU already made a big concession back in November by accepting the UK could stay in a temporary customs union if the Irish backstop ever kicks in - and that still wasn’t enough to win over concerned British lawmakers. There is also no guarantee any changes would make the critical difference. 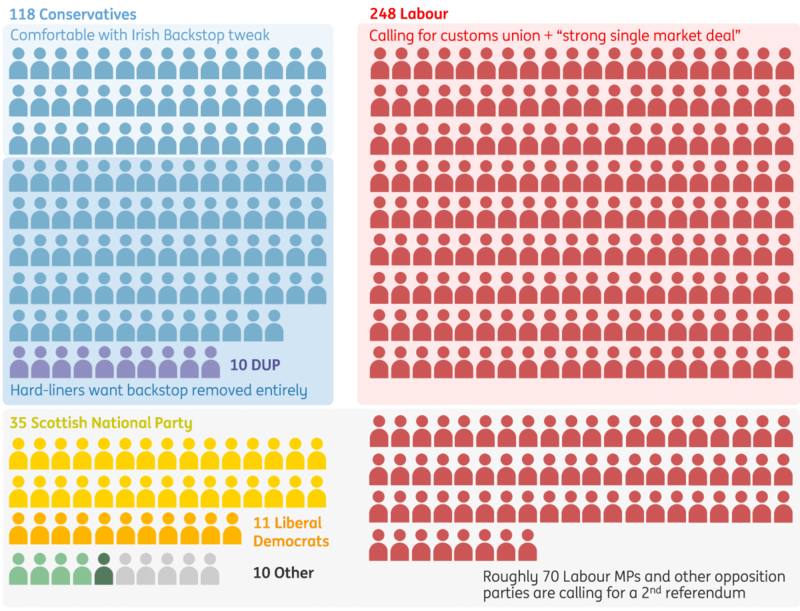 While the 118 Conservatives and 10 DUP MPs that voted down the deal largely did so because of the backstop, there is a range of opinion on what needs to happen to it. Some would be happy with some legally binding tweaks, while many others won’t support the deal unless the backstop goes entirely. The upshot is that when Theresa May returns to the House of Commons on 14 February to update MPs, nothing is likely to have changed. Once again, this will be done in the form an amendable motion, which means that lawmakers will again be able to put forward their own suggestions on the way forward. This may include ‘indicative votes’ on different Brexit alternatives, although these are unlikely to be conclusive. A second referendum currently lacks the support of the bulk of the Conservative party, as well as many Labour lawmakers, several of whom represent Leave-supporting areas. The road to a ‘different’ deal also remains treacherous. While an alternative plan (e.g. a commitment to a permanent customs union) arguably stands the best chance of securing a majority in the House of Commons, getting there would see the Brexiteers in the Conservative Party rapidly lose patience. Labour Leader Jeremy Corbyn may well try and leverage this discontent in a repeat no-confidence vote. Even if this is unsuccessful, pro-Brexit MPs could attempt to frustrate the process of translating the UK’s exit into law as the various Brexit-related bills move through parliament. One way or another, the impasse looks set to continue for some time, although of course time is something that is running out fast. 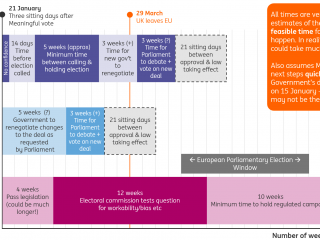 If a ‘no deal’ situation is to be avoided on 29 March, it looks increasingly inevitable that the Article 50 process will need to be extended. Lawmakers may try to lay the groundwork for this again on 14 February, by trying to force a repeat vote on the so-called ‘Cooper amendment’, that would give MPs a vote on extending Article 50, if the government’s deal doesn’t pass by the end of February. It’s worth remembering the EU member states must unanimously approve the Article 50 extension – although it’s looking increasingly unlikely that they would object. But while that might be true, nobody really knows how long any extension might last. Austria's Chancellor Sebastian Kurz said in January that any extension shouldn't go beyond the European parliamentary elections (due to take place in May), but there have also been suggestions it could last much longer. Either way, it could be quite some time before we know which Brexit option will prevail. In the meantime, UK growth is likely to continue to stall as businesses prepare for a hard Brexit, as it may not be until March before we know for sure whether ‘no deal’ has been truly avoided. Throw in growing concerns about the international trade outlook, and we suspect UK growth this year may only be marginally better than in 2018. All this means a rate hike from the Bank of England is highly unlikely in the first half of this year. Brexit blog: Finally, a fudge?